It turned to be a star-spangled occasion on (February 15) at Lady Andal School in Chennai as the celebrities from Tamil and Malayalam film industry thronged up for the most fascinating 8th Annual Edison awards. The awards ceremony is held every year in the name of Thomas Alva Edison, who is regarded as the ‘Father of Cinema’. Dhanush clasped the best actor award for his sensational performance in ‘Velai Illa Pattadhaari’ and Anirudh for his stunning music in Kaththi as ‘Best Music Director’ and Velraj gained the ‘Best Debut Director Award’. Anirudh thanked everyone for making a sort of reunion for ‘VIP’ team. Chandran won the ‘Best Debut Actor’ award for his stupendous show in Prabhu Solomon’s Kayal. Catherina Tresa won the Best Female debut actor award for a decorous show in ‘Madras’ and Attakathi Ranjith bagged the ‘Best Director’ for his unparalleled work to the same film. Bobby Simha for Jigarthanda gained his accolades amidst heavy applause and unceasing whistles. Parthiepan won the ‘Best Screenplay Awards’ for an impeccable narration in his comeback film ‘Kathai Thiraikathai Vasanam Iyakkam’. 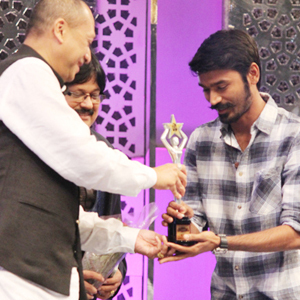 During this occasion, he thanked everyone who voted him and said, “I am sure that the people’s perception of cinema has changed and it goes very well with the way, they have embraced this film.” Hip Hop Aadhi fetched the best praises and appreciations as ‘The Rising Star of 2014 Male’ and what became the most fascinating part of attraction was ‘Gaana King’ Deva performing the song ‘Open The Tasmac’ after winning the award for ‘Best Song 2014’. Proving a versatile style of conceptualisation, Vinod won the ‘Best Story’ Award for ‘Sathuranga Vettai’ and collected his honours along with producer Manobala. The angelic gal of the show, Vedhika appeared so gorgeous with cute looks won the honours of ‘Extraordinary Performance (Female)’. Mr. Selvakumar, CEO of My TamilMovie .com rendered a heart-warming welcome speech and honoured the Honorable His Excellency Dato’ Seri Mohamed Nazri Bin Tan Sri Abdul Aziz, Minister of Tourism and Culture, Malaysia. The Ministers of Malaysia were amazed at the beautiful response of the spectators and were high on regards for them and invited the Tamilians here to Malaysia for a beautiful experience. They earnestly thanked Mr. Selvakumar for a great attempt to bring the Tamilians across the world as one and honouring Malaysian artists as well during this occasion.